Join us on July 13th as we compete in Houstonia’s 3rd Annual #BurgerBash presented by KHOU, Uptown Park & Rebecca Creek Distillery! 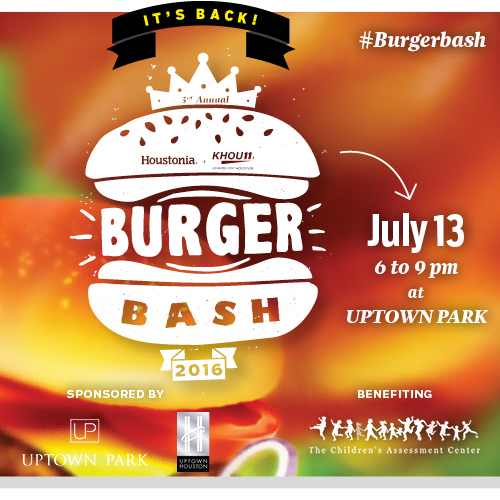 16 of Houston’s best restaurants are brining out their burger A-game for one mouth-watering night at Uptown Park benefiting The Children’s Assessment Center. And don’t miss the Texas Ranger Whiskey Dipping Challenge, where restaurants will compete for best condiment or sauce! Buy tickets at Houstoniamag.com/burger! VIP includes early access to sample burgers at 5pm and first tastes.